The world’s first remotely operated commercial vessel has been demonstrated by Rolls-Royce and towage operator Svitzer in Copenhagen harbour. Svitzer´s 28m long Svitzer Hermod is said to have undertaken a number of remotely controlled manoeuvres earlier in the year. From the quay side in Copenhagen harbour the vessel’s captain, stationed at the vessel’s remote base at Svitzer headquarters, berthed the vessel alongside the quay, undocked, turned 3600, and piloted it to the Svitzer HQ, before docking again. 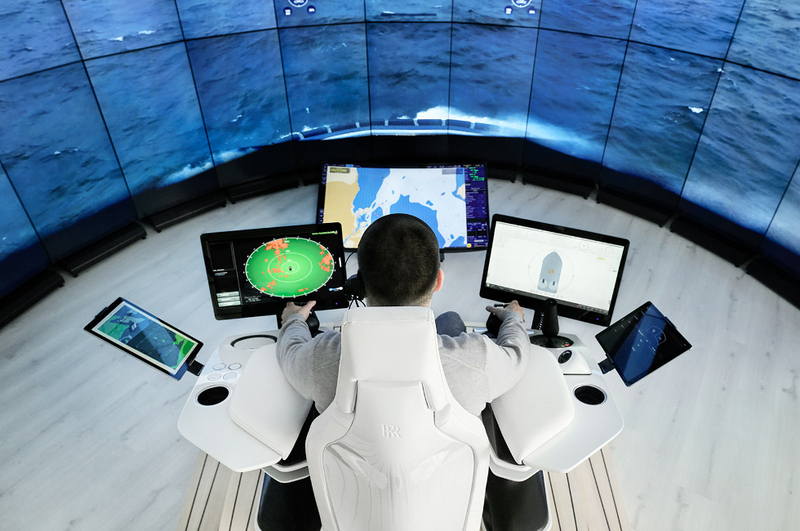 The companies will continue their cooperation to test remote and autonomous operations for vessels with primary systems made up of autonomous navigation, situational awareness, the remote control centre and communication. Built to a Robert Allan ship design, the Svitzer Hermod is equipped with a Rolls-Royce Dynamic Positioning System, which is the key link to the remote controlled system and helps the vessel to automatically maintain its position or heading by using its propellers, rudders and thrusters. The vessel is also equipped with two Rolls-Royce MTU 16V4000 M63 diesel engines each rated 2000kW at 1800rpm. Sensors installed on the vessel combine different data inputs using advanced software to give the captain an enhanced understanding of the vessel and its surroundings. 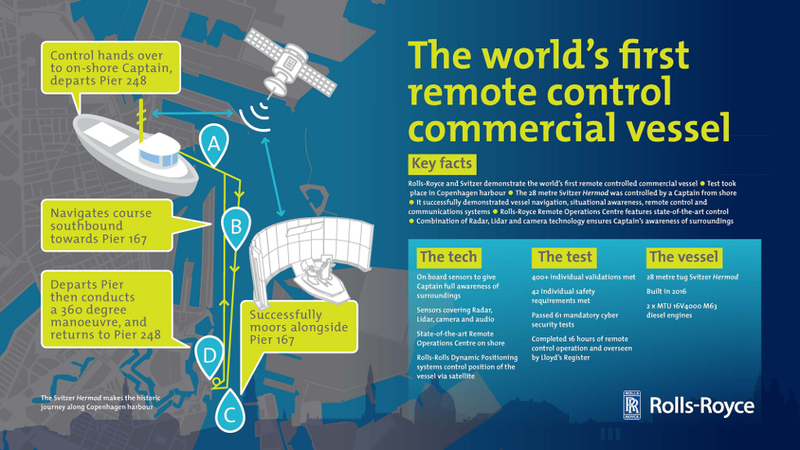 The data is transmitted to a Remote Operating Centre (ROC) from where the Captain controls the vessel. Rolls-Royce said the Remote Operating Centre was designed to redefine the way in which vessels are controlled. Instead of copying existing wheelhouse design the ROC used input from experienced captains to place the different system components in the optimum place to give the master confidence and control. 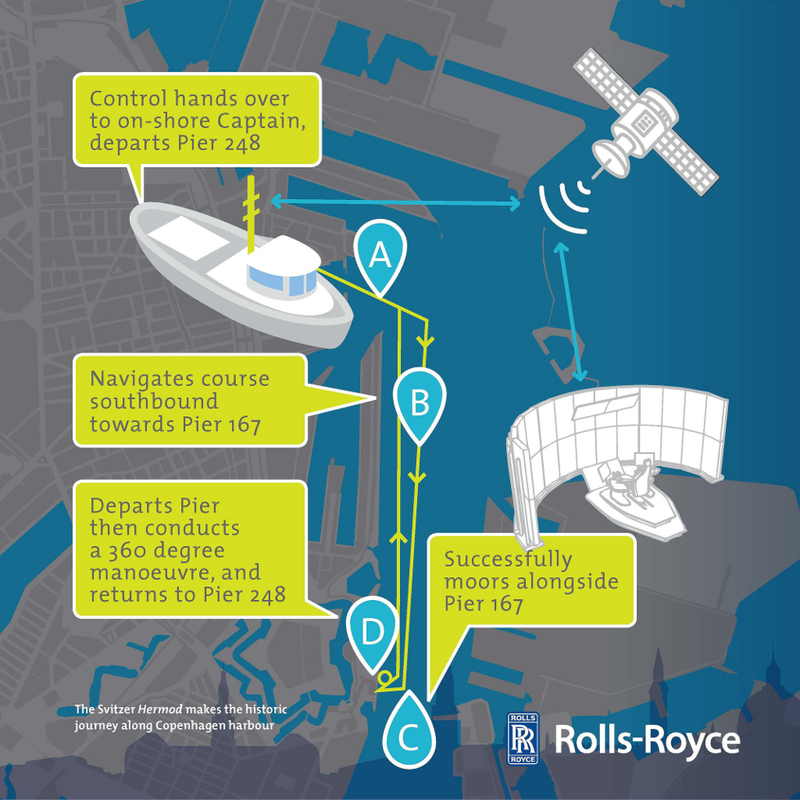 Rolls-Royce said the aim is to create a future-proof standard for vessels controlled remotely. Lloyd’s Register’s Marine & Offshore director, Nick Brown, commented: “Working on this project with Rolls-Royce and Svitzer and supporting them on the safe demonstration of the Svitzer Hermod is truly a landmark moment for LR and the industry. This is excellent collaborative innovation by Rolls-Royce and Svitzer. And when communication between the controller and the vessel fails; what happens then? Are we left with a ship adrift, or plowing the waves on the last heading at whatever speed it was last set at? I assume if this is to be eventually developed into larger vessels carrying out global trade the control systems used on board will have to have a high level of redundancy, segregated protection for fire or flood and a fail safe philosophy built into the various systems. Let’s put everyone out of work and watch the robots drive the consumer driven economies of the globe. Maersk ships will sail the oceans of the earth almost empty because no one will be able to pay for the goods transported (which generate your profits). They will become like the aircraft of today – Crew not generally required but are there for confidence and the unexpected !